A stylish ladies' bracelet Swiss-made watch from Bulova. Made from stainless steel with highlights of rose gold tone, the round dial boasts shimmering silver tone and diamonds positioned at the 3, 6 and 9 o'clock hour marks with a rose gold tone bezel. A chic combination of modern style and classic elegance. 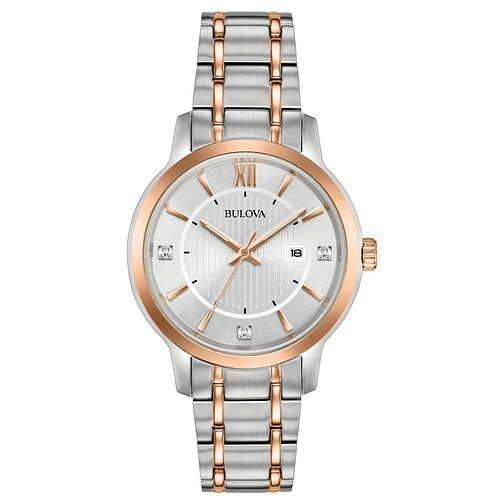 Bulova Ladies' Two Colour Stainless Steel Bracelet Watch is rated 5.0 out of 5 by 3. Rated 5 out of 5 by Anonymous from beautiful watch beautiful watch, the steel is of good quality. it looks amazing. Rated 5 out of 5 by Anonymous from Lovely watch which was bought as a gift Really pleased with the purchase. Looks nice and good quality feel and design.